Frivolous Foodie | Friv-o-lous [friv-uh-luh-s] adj: characterized by lack of seriousness. Food-ie [foo-dee] noun, slang: a person keenly interested in food, esp. in eating or cooking. I am excited to report that today at noon is the start of a much-needed weekend getaway. About 4 years back, while traveling to various wineries in the area, my mom happened upon a little artist community (they dub themselves “The Art Coast of Michigan), Saugatuck. Upon her return, she told the husband and I that we had to make a trip up there. In researching various places to stay in the area, we found a B&B called The Kirby House, booked a stay and had the best time there! The owners, Jim and Ray, are excellent hosts who create a warm and comforting atmosphere. Ray is an amazing chef who provides delicious breakfasts each morning of your stay and I’m pretty sure Jim does the baking. The town of Saugatuck, itself had much to offer in the way of cuisine, wine and lots of unique shopping. What exactly is the culinary aspect of the getaway you ask? Well, The Kirby House offers a cooking class package twice a year. My mom and I attended last year and had a fabulous time. Some of the dishes we prepared were stuffed pasta shells and (my favorite) butternut squash risotto. My sister is joining us for this trip and I am looking forward to a relaxing weekend of food, wine and spending time with some of my favorite ladies. I am certain I will have much to report back on (pictures too, promise)! Hope everyone has a great weekend! It was certainly a busy Halloween. Between a festival (where we acquired some INSANELY good kettle corn), pumpkin carving and trick-or-treating (our little guy was a chef, so cute! ), I was ready for some R&R by Sunday. Which worked in my favor because I was able to finally toast the pumpkin seeds from our carving on Friday night. 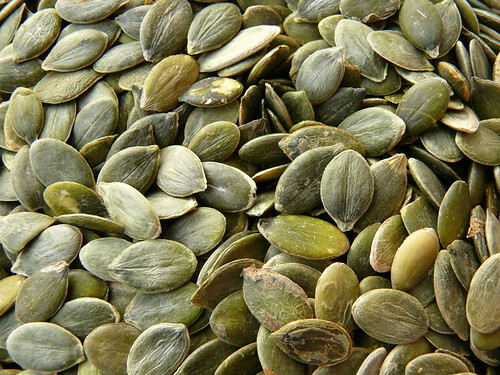 I had never toasted pumpkin seeds before so I ventured online to look for some ideas and there were so many! I found variations using vegetable oil, olive oil and butter and a slew of seasoning and oven temperature variations. I got the gist, though: Add fat, season liberally and roast until golden or smelling good! I had the seeds from one huge pumpkin and the seeds from a “pie pumpkin” which the guy at the market told me was a little sweeter. After looking around, I combined some of what I saw and came up with these two methods. -Throw onto sprayed or lined cookie sheet, roast at 350 for approx. 20 min, stirring every 5 min. That’s it. They turned out pretty yummy, indeed. The cinnamon sugar seeds were a hit with our little guy and myself, while the hubby was guarding the spicy seeds like they were solid gold. Add to the yummy-ness factor that these seeds are a way better snack alternative to potato chips and I am sold. When they are gone, I am thinking of trying out squash seeds and some different spice combinations. I’ll keep ya posted! Hope everyone had a great Halloween! I am going to file this under the “a tip that some people might already know but I didn’t, so I’ll share it,” category. Sadly, the recollection of information received was much later than when I actually discovered this little nugget of info. I read it in a magazine what seems like forever ago and it was one of those things, you know, where you get the info and you think “hmm, interesting…” and then one day you’re in your kitchen and for whatever reason, it pops into your head and you decide today is the day to try it. Well, today was that day for me and the tip actually worked! Because it was so long ago, I cannot recall which magazine I was reading, sadly and I am not going to try and pinpoint it. Between my subscriptions (I am a magazine person, not green but I must have them! ), the mags in our office lounge and the obscure skimming that takes place in physician waiting rooms and the grocery store line, I have no idea where it came from. So the piece was centered how to achieve a moist muffin and there were all sorts of tips in the article but the one I had not heard and that I successfully attempted today was to fill all but one of your muffin cups in the pan. Instead of a liner and batter, fill that last one 1/3 the way up with tap water. As the muffins bake, the moisture from the water evaporating goes straight to your muffins. It’s almost as if they are being steamed as they bake. And it totally worked on my blueberry muffins this morning. Nothing fancy, just a recipe I found from the blueberry experts. It was by far the most moist batch of muffins I’ve made yet. I am betting the same trick would work with cupcakes. Nice, right? When I got a call early Tuesday morning from my child care provider saying that both of her school-age children had come home from school Monday with a fever, I knew I would not be taking my son to her that day. When I got a call from her mid-Tuesday to say that it was believed that they both had contracted the h1n1 virus, I started calling in the favors. I was not particularly comfy with him being there at all this week so I needed to arrange some back-up babysitting. All in all, I was pretty successful, with the exception of today. Today, there was no one who could help me out so I decided one days’ worth of work could wait and took the day off to help avoid the possibility of my son contracting the illness. We have a Harvest Party to go to tomorrow and I have volunteered to bring a pumpkin roll along. 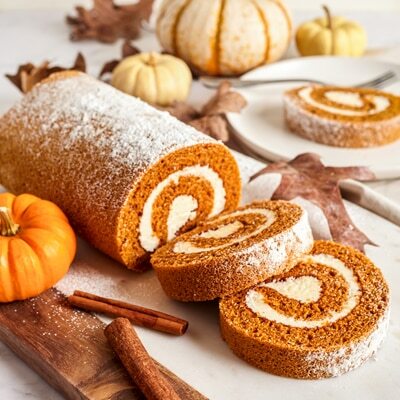 I use Libby’s recipe for the pumpkin roll and it is always a hit. I always use the nuts (usually extra) and be sure to use the combination of spices in lieu of the pumpkin pie spice. It really does make a difference. It is also my twin nieces and a nephew’s birthday this weekend so I will be making a double-layer chocolate fudge Halloween themed cake for the youngsters. I am especially pumped up about making this one because the little guy will get a kick out of decorating with gummy bats, mummies and zombies along with Halloween sprinkles and the like. I plan on getting this kitchen very, very messy today! Lastly, we have a pumpkin pie. Here’s the story: In telling the hubsters that I would be staying home with the little guy and baking up a storm, he had asked what we would be baking. Once I told him, that little light bulb went off in his head. He knew I had to buy pumpkin puree and remembered the last time that I made it, there was extra pumpkin. Pumpkin pie is by far and away his favorite dessert (I have made it a couple of times in May for his birthday!). So his genius plan is for me to by the larger can of puree so that I have enough to make both the pie and the roll. And hey, I have the day off, so it can easily be done! I use Libby’s recipe for this as well. Figure they are the pumpkin people, so I should trust them. I did see an awesome recipe recently in Bon Appetit, but I’ll have to save that for another day when the craving is not for traditional pumpkin pie. So not only will I be hard at work concocting three tasty desserts but I will be doing so with the assistance of a 2 yr. old kid who loves to stir, dump, mix….and throw things. Should be fun. Wish me luck! I am thankful to spend the day with him when I would normally be away from him but hopefully, all will return to normal next week! I am a recipe person. That is just all there is to it. There is something about following the recipe and the assurance that by following it, the dish will work out. Of course, we all know that is not always the case (especially when baking, I find). But still, I take solace in recipes. I oftentimes wonder as I am watching programs like Iron Chef or Top Chef how they can possibly just come up with fantastic sauces or marinades or foams all on the fly with no recipe. I am in awe of it. 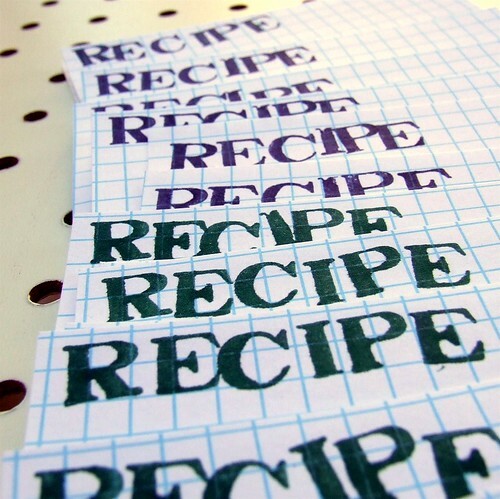 Knowing that I find it comforting to follow a recipe doesn’t bother me. I am not a chef, so there is nothing wrong with letting someone else think up the idea and my carrying it out. But on Monday evening I was presented with a personal challenge of sorts. I got a call from the hubby to discuss the usual, “here’s what happened at work, who is going to pick up the little guy and oh, what should we do for dinner…” When he says he is craving some Chicken Parmesan. To which I reply that we’ll go to our favorite Italian place and grab some and he says he’d rather stay in. I had already left the office and wasn’t about to go home to look up a recipe and then trek back out to the grocery where the rest of the neighborhood is at 5:30pm on a Monday. So I challenged myself. I cannot even count the number of times I’ve eaten Chicken Parmesan and come on, it’s a totally un-complicated thing to make. Perfect for my first try at a non-recipe dinner! As confident as possible, I ventured through the grocery before the craziness hit and went home to give it a whirl. I actually was able to pull off a pretty mean Chicken Parmesan without even a cheating glimpse at a recipe. I measured nothing and let me tell you, it was pretty liberating. My head kept focusing on the laptop perched on our dining room table begging me to do a little research but I stayed the course and got it done. Because it is a non-recipe, recipe, there is no recipe for me to provide. More like guidelines. First, I took about 2 pounds of boneless, skinless chicken breasts and butterflied them because they were massive. I then pounded them out a little and seasoned them. Next, I put around 1 cup of flour onto a shallow plate and mixed in some dried oregano, garlic powder and some kosher salt and pepper. In a saute pan, I heated a few tablespoons of extra virgin olive oil (and no, I will not use EVOO…ever!) along with a couple of tablespoons of unsalted butter over high heat. Once it was nice and hot, I dredged the chicken into the flour, shaking off excess and threw it into the hot oil/butter goodness. While those were going, I sliced some red onion pretty thin and minced 2 cloves of garlic. After about 3 min., I turned the chicken and after about 2 min., I pulled it out and placed it on a rimmed baking sheet that I had lined with foil. I then added the onions to the hot pan and after about 3-4 minutes, added the garlic as well. Sidenote: I totally sprung for the store-bought marinara because I am not a woman who spends Sundays creating homemade marinara to freeze until needed and I’m not sure I’ll ever be, so yeah, I bought the jarred stuff. Shoot me. I poured the jarred marinara over the onions, garlic, oil and butter and quickly reduced the heat. Once it was heated through I moved the chicken off of the baking sheet long enough to put about 1/2 cup of the sauce underneath it so it wouldn’t stick. I then placed the chicken on top of the sauce and topped each one with more sauce. I covered the pan with foil and let it bake for 8 minutes. I then pulled the pan out, took the foil off, topped each breast with fresh mozzarella (makes up for the jarred sauce, I think) and put it under the broiler. Get some nice whole wheat/whole grain pasta – they seriously have such a great selection of good for you pastas now! I am certain my mother is bitter about all of those spaghetti meals she served us back in the day. Anyway, place your chicken on top of your pasta, add some more sauce, get a glass of your favorite wine, maybe some crusty bread and viola! A non-recipe, recipe! Should have taken a picture but by the time I thought of it, the end-product had been devoured. Next time, though. I definitely feel that I am less intimidated by a non-recipe meal. I remember back when I was a part of a team that was opening a new restaurant in town. This particular establishment was one of many in a chain and I’ll never forget the amount of emphasis that was put on consistency. Sure there was training on how to operate the computer system, completing sidework, memorizing table numbers and so on, but there was nothing more focused on in the training series than the importance of consistency. People needed to walk in to our restaurant and order the same dinner someone was ordering in an establishment across the country. Likewise, if you were visiting another state you could dine in comfort knowing your favorite item would be on the menu, prepared in exactly the same manner as your neighborhood place. I understood this perspective, of course but it never truly hit home for me until now. I am in love with the Fall season and when it is upon us my food cravings are in overdrive. Cravings for complex chutneys that can somehow be savory, tart and sweet all at the same time, cravings for pumpkin laced with cinnamon, nutmeg and clove – you get my drift. When I got a call from an old friend wanting to go to lunch, I had just the thing in mind. Paradise Bakery and Cafe features a sandwich that I experienced for the first time last Fall and fell in love with. I only had it a couple of times and I was in serious crave mode, so off we went. Looks tasty, eh? The Turkey Cranberry is a wonderful sandwich comprised of roasted turkey slices, fresh cranberry sauce, lettuce, tomato and mayo all piled high on their homemade molasses bread. Y.U.M. I normally don’t edit my menu selections but I am a bit of a sauce snob and not a fan of a glob of mayo on my sandwich, especially one that is already dripping in delicious, tangy cranberry sauce. So I forego the mayo and as usual, you edit a menu item and bam, it throws the cooks for a loop. My sandwich comes out sans mayo, as requested, but also sans tomato and lettuce. “No big deal,” I think to myself. The lunch crowd is fierce in this place so I didn’t make a fuss. Besides, the main components were there. That’s when something odd looking caught my eye and I noticed there was a huge scoop of stuffing (read: aka “dressing” depending on who you are) smashed in between the two pieces of beautiful bread! Consistency people, consistency! This was way out of left field. There is nothing on their menu that even has stuffing on it, so I was really wondering what was up with that. Like the guy had some left over Stove Top from his lunch that day and decided to jazz up my sandwich. I simply scooted the mushy pile of stuffing off and ate what was left of the sandwich but I have to tell you, it is totally ruined for me now. What was a perfect combination of Fall flavors in one location turned out to be a disaster in another. I suppose that GM who trained me knew his stuff after all. My apologies for the hiatus. I figure since I don’t have too many (if any) foodie followers yet, that my absence is forgiven, if even noticed. So, two big pieces of news to catch everyone up on. 1. I didn’t end up making the lobster mac-and-cheese for the anniversary dinner, after all. Turns out in the lovely state of Indiana, we don’t get the greatest selection of lobster and when we can get our hands on some, it’ll cost ya a whopping 45 bucks a pound. Pair the cost of the lobster with the cost of the gruyere and aged white cheddar and I was looking at a pretty pricey “night-in” without even picking up the wine yet. I have been known to splurge when it comes to cooking but while pondering the cost of the lobster, my eye wandered into my grocery cart and onto the jumbo package of Huggies…and I knew what I had to do. I went with our ole standby, crabcakes. We love crab and I actually have recipe that we really enjoy memorized from our days back in the restaurant biz, so it was a no-brainer! We had them alongside some baby greens with shaved parmasean and balsamic vinegarette and an appetizer of crostinis topped with the aged white cheddar (I had already picked it up from the farmer’s market) and sliced galas. Pretty tasty indeed. The Wine Department – Nothing else really needs to be said here, right? The Cigar Shoppe – More for the hubster but a serious selection to choose from and super reasonable! The Bakery – I’ll say it again, THE BAKERY. Everything from cakes, cookies, teacakes, homemade granola, fresh breads (including my personal favorite, the jalapeno cheddar) to gourmet baked goods for your dogs, this bakery is like Grandma’s kitchen on steriods. The International Market – The teas, chutneys and marmalades imported from England, olive oils imported from everywhere and a wide range of spices imported from India topped the list of what impressed me within the International Market. Sure, the store had it’s fair share of tackiness including large “amusement park”-type characters that sing and dance but hey, with the selection they offered, it was worth subjecting myself to such tackiness. And besides, if I would have had the little buddy with me, the takiness would have served as a great distraction to allow Mommy more browsing time.